I have been practising as a qualified psychodynamic therapist in various settings since 1998. In 2013 I began offering therapy using horses in partnership with my colleague and highly experienced horsewoman, Martha Lindsell. We use Martha's herd of 5 friendly, curious and well-trained horses. Horses are naturally social animals who are alert and responsive to feelings in us. 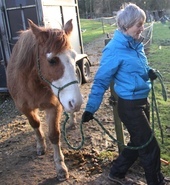 Interacting with a horse, under Martha's careful guidance, can help identify aspects of ourselves we have been unaware of. The non-verbal interaction with a horse prompts our thoughts and feelings. The session is in two parts - one is the interaction with a horse or horses, the other is a chance to talk this through and reflect on the experience. No riding is involved and no experience with horses is needed. You do need to be steady on your feet, able to walk for about 45 minutes and happy to be outside.